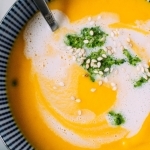 The base for this soup is carrots, yellow or orange sweet peppers, onions, garlic and ginger – pretty straight forward. 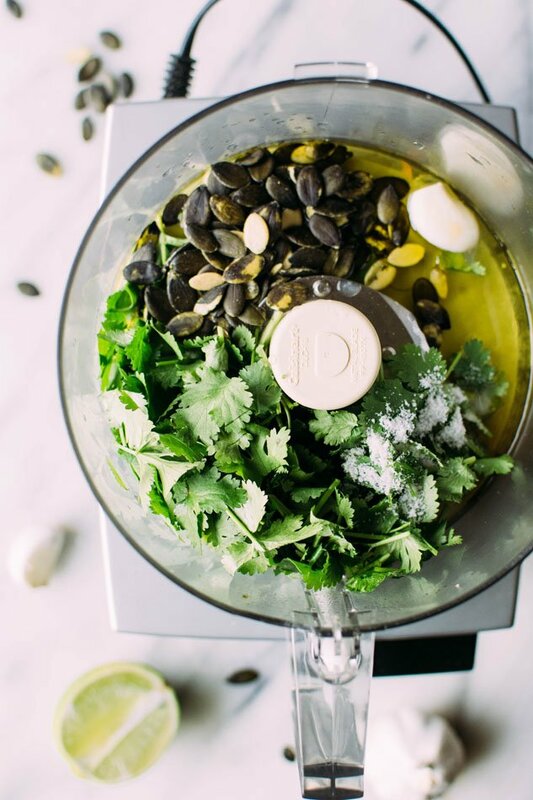 But the magic really happens when you add all of the aromatics + spices to the pot – lemongrass, lime leaves, ground coriander, turmeric, white pepper and an optional dash of chili flakes for those who like it hot. 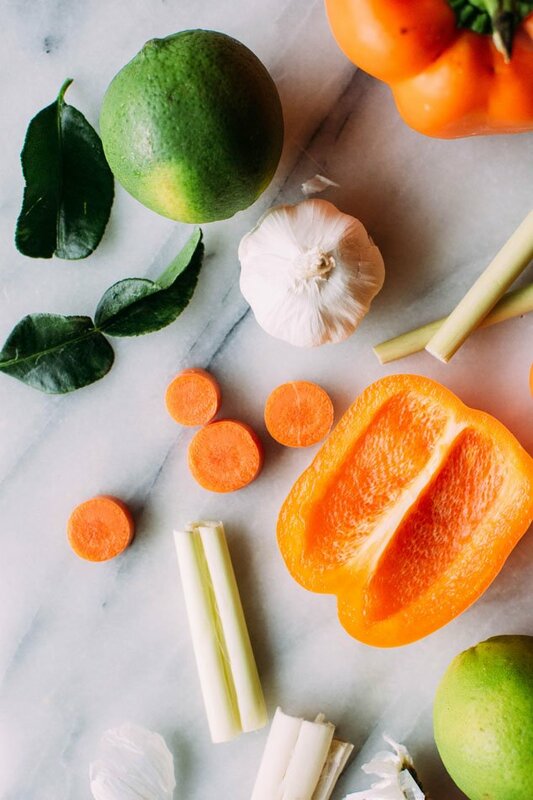 I have made a note about this in the recipe BUT if you can’t find lemongrass // lime leaves you can substitute a little bit of yellow // red curry paste in with the other spices as these pastes will almost always have those ingredients in them and impart that distinct thai flavor. 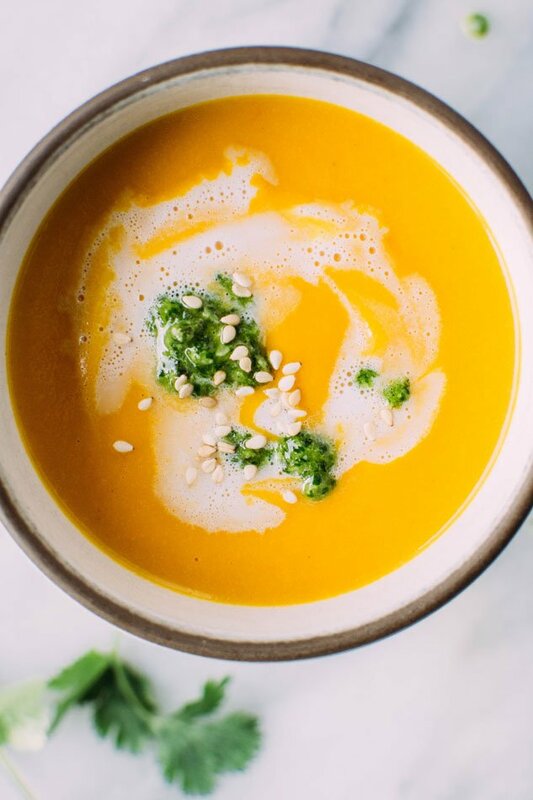 I love the bright and lively flavor compliment that it brings to the warm spices and sweet carrots + peppers in the soup. It can also go on lots of other types of dishes, so if you make a jar of it for this recipe and then have some to tuck into your fridge it will not at all be a horrible situation! 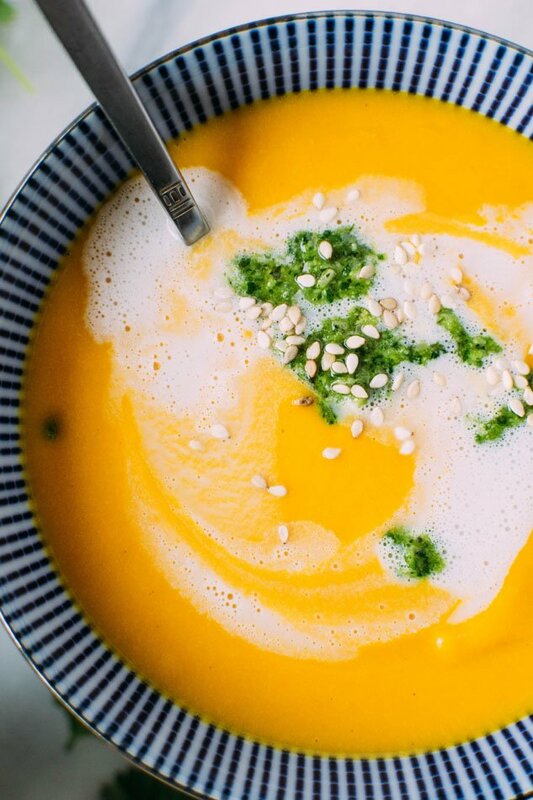 But getting back to this soup – I love it and I think you’ll love it too! 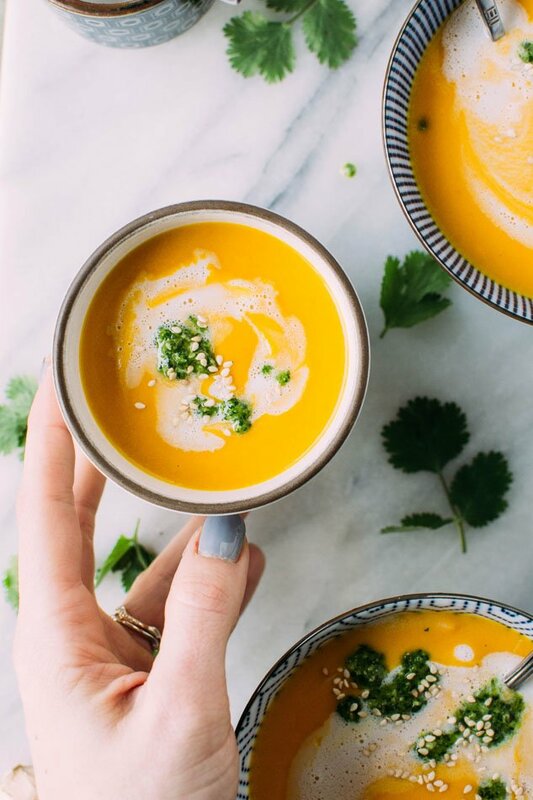 Give it a try this week in your meal plan – maybe paired with some thai marinated shrimp or poached fish over some shredded romaine (with cilantro pesto for dipping // drizzling!) and I don’t think you’ll regret your decision. 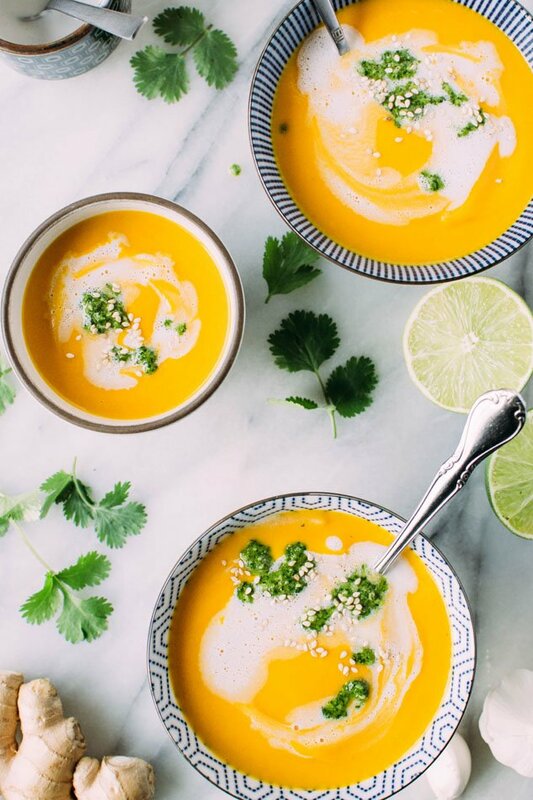 Thai carrot and sweet pepper coconut soup with cilantro pesto – The perfect, vibrant, veggie packed soup for your midwinter cravings! 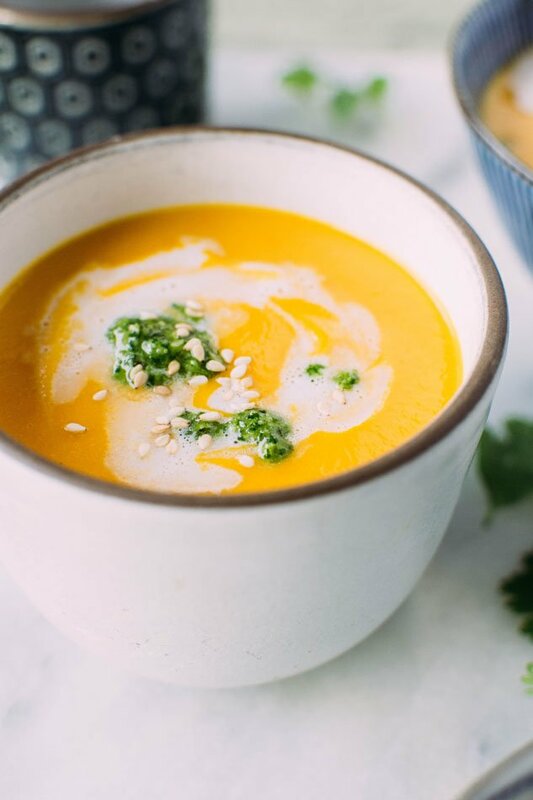 It’s loaded with carrots, sweet peppers, onion, garlic, lemongrass, lime leaves and spices, blended with some creamy coconut milk and topped with a fresh and flavorful cilantro pesto. Heat ghee // coconut oil over medium heat in a large pot. Add diced onions and sauté until translucent and starting to brown, about 6 minutes. Add thinly sliced garlic and ginger and cook another 2 minutes, stirring occasionally. 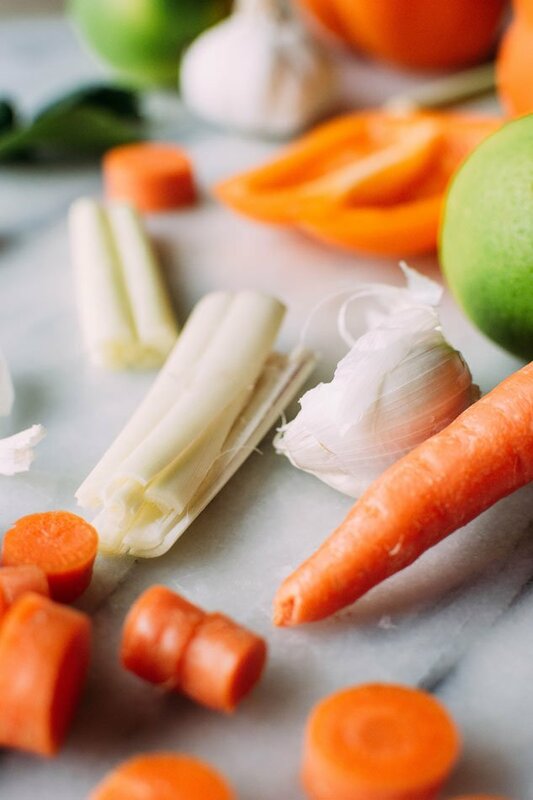 Add carrots, peppers, smashed lemongrass, and lime leaves (crush leaves with your hands before adding to release oils) and spices -. saute for about five minutes, stirring occasionally so nothing sticks to the bottom of the pot. 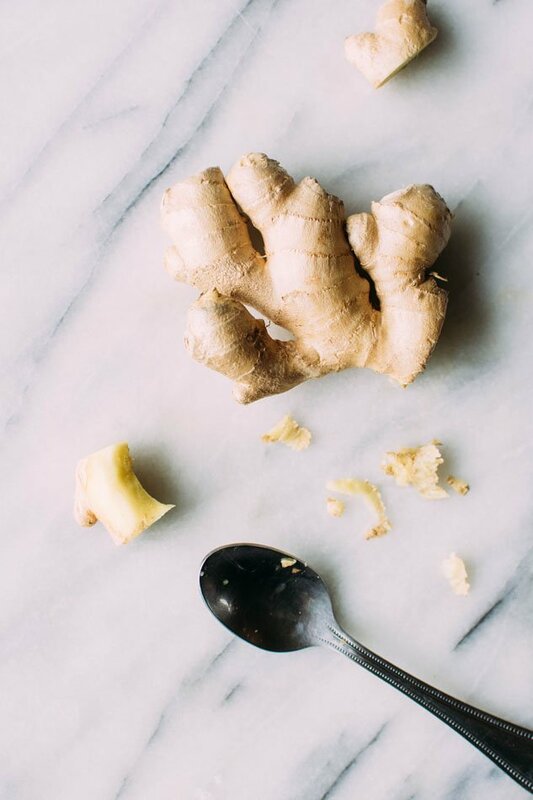 Pour in broth, bring to a simmer and cover. Cook for about 15-20 minutes, or until vegetables are very tender. 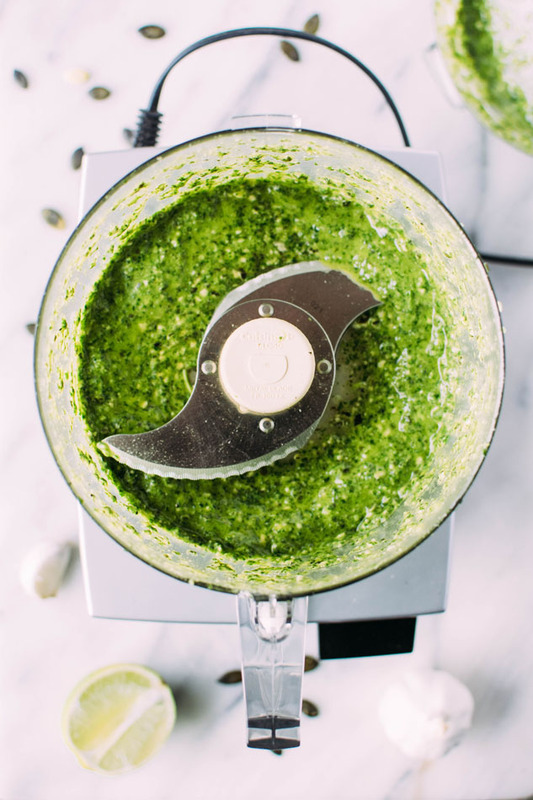 While soup is cooking you can make cilantro pesto, see directions below. 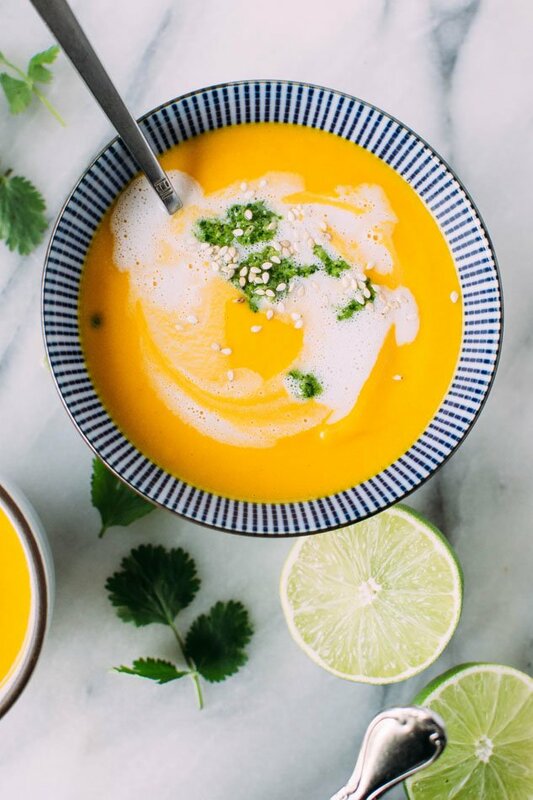 Return soup to the pot and season with salt and fresh lime juice. 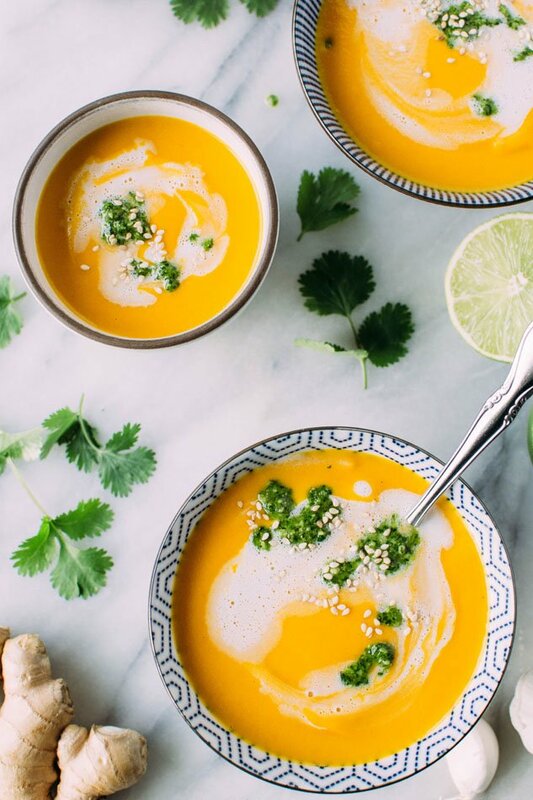 Ladle soup into bowls and top with a spoon of coconut milk, a few dallops of cilantro pesto and some toasted sesame seeds. 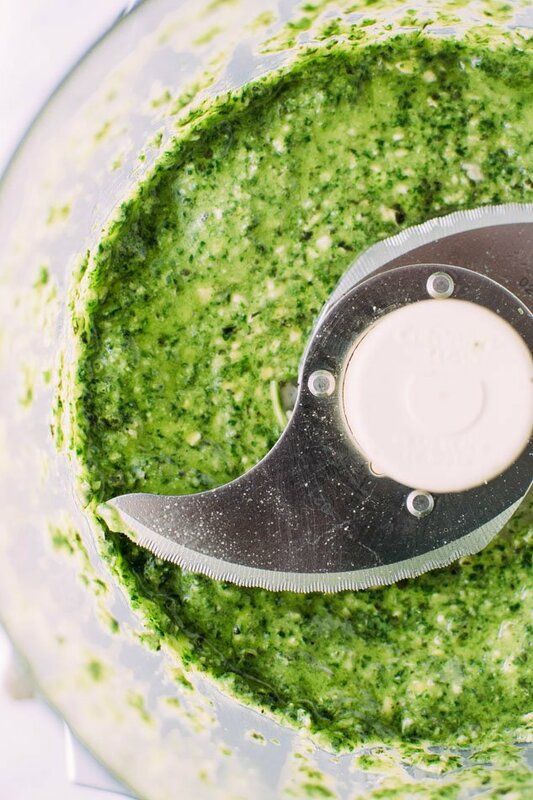 Add all ingredients for pesto to your food processor and process until well combined, stopping to scrape down the sides if necessary. Taste and adjust seasoning if desired. Move to a container and store in the refrigerator for up to one week. 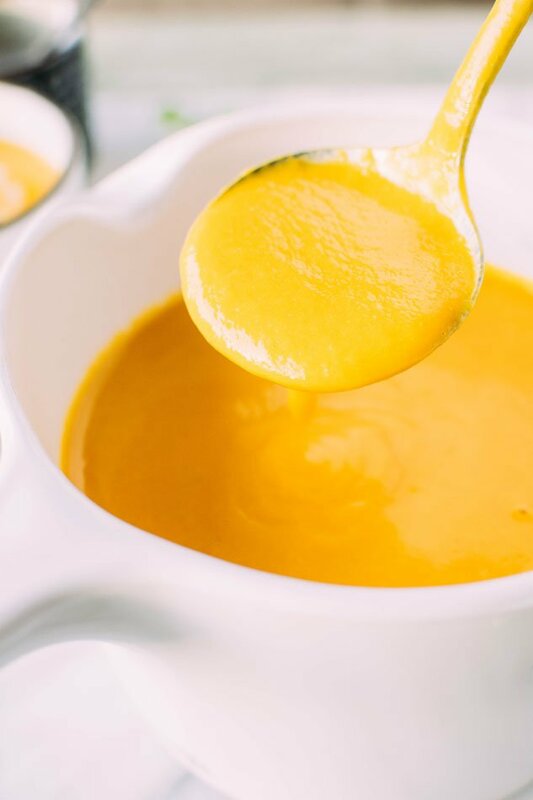 *if you can’t find lemongrass and lime leaves you can substitute a little bit of a store bought curry paste – in this case red or yellow would be the best so as not to throw off the color of the soup. These pastes usually have some lemongrass, lime leave and galangal in them which are all really strong flavors in thai cuisine.